December 22, 2012 — Despite a federal judge’s ruling authorizing a land transfer for the proposed Jefferson Parkway, the planned toll road still faces significant obstacles, Golden noted today. On Dec. 21, Federal District Judge Philip A. Brimmer issued an opinion upholding the federal government’s decision to transfer land on the Rocky Flats National Wildlife Refuge for construction of the Jefferson Parkway. In December 2011 the Town of Superior filed suit challenging the decision to transfer the land. Shortly thereafter, the City of Golden and two environmental groups joined the lawsuit. Golden had joined the lawsuit in January to halt the transfer by the Fish and Wildlife Service of land on the Rocky Flats National Wildlife Refuge for the construction of the proposed Jefferson Parkway, arguing that the Service decided to convey the land without adequate environmental reviews or mitigation. The lawsuit alleged that the Fish and Wildlife Service (1) failed to conduct adequate environmental analysis of the effects of the property conveyance and the Jefferson Parkway, (2) unlawfully rejected Golden’s separate application for the strip of land, and (3) failed to ensure that environmental effects on the Refuge were minimized. Golden identified a number of serious harms to the City and its residents, including congestion, noise and air pollution from increased traffic on already-congested roads. While pursuing its lawsuit challenging the land transfer, Golden has continued to work constructively with neighboring communities and the State to identify collaborative solutions to the region’s transportation challenges that satisfy all parties. 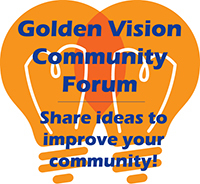 Golden also engaged its citizens in a community conversation that evaluated possible road designs and established parameters for Golden’s discussions with these other entities.